Flipcharts have been used as effective aids for presentations, workshops and brainstorming sessions for many years. 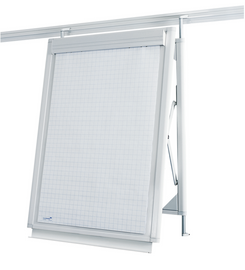 Over time, Legamaster has developed various types of flipchart. 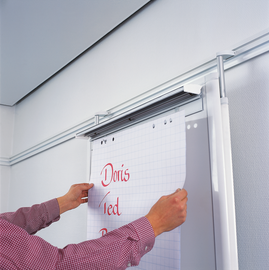 We also offer wall-rail and wall flipcharts designed specially for use with our space-saving rail systems. Both variants can be used as a flipchart and as a whiteboard. 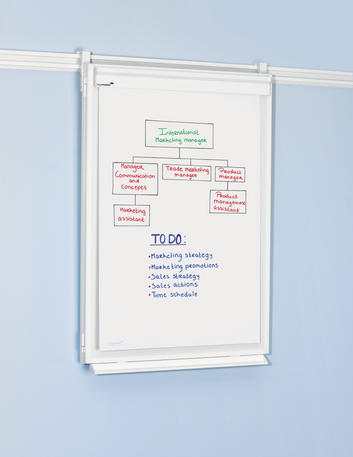 The hinged design of our wall-rail flipcharts means that used sheets of flipchart paper can simply be turned over. The additional rail channel also enables sheets of paper that have been torn off to be hung up again. Want to find out more about our flipcharts for rail systems? Use the filter links to select the right features for your flipchart. Want to find out more about our flipcharts or have a question to ask? Please contact us.